In the first part of this article I discussed the use of Neutral Density filters as a tool that enables photographers to create images with long shutters speeds during the day. This article is more for filmmakers and videographers for whom NDs are a fundamental creative and technical tool that allows the use of large apertures. This second use is typical for shooting video, although the principles apply to still photography in exactly the same way. The reason why video is such a special case is that most filming needs to be done with one particular shutter speed. There are exceptions but as a rule most films that you see in cinemas or the programs you watch on TV were shot with a shutter speed of 1/50th of a second. That means that cinematographers cannot really use shutter speed as a technical means to control exposure! They are stuck with one number. They still have light, aperture and ISO to work with, but as you are probably aware, noise makes ISO the least preferred way to control the brightness of your shots. So, you are left with aperture and light. This is why light is everything for cinematographers: lamps are both technical and creative tools. On the one hand, lights create sufficient illumination to shoot a scene at a given ISO and a desired aperture. On the other hand, lights create mood and tell a story. The only other viable tool filmmakers are left with to control exposure is therefore aperture. But what if the technical need for controlling exposure goes against the creative need? How can you achieve shallow depth-of-field in broad daylight? Try this: On a bright or even on an overcast day try to see what is the largest aperture you can have if your shutter speed has to be 1/50th of a second. It will be a rather small aperture even at ISO 100 – probably somewhere between f/11 and f/22. But what if you want an image with shallow depth-of-field? You would need a large aperture for that,e.g. something around f/2.8 or f/4! But you can’t have it, not unless you pick a faster shutter speed. A big ‘can’t do’ for cinematographers. Remember: shallow DOF means a physically large aperture that lets in lots of light. In still photography you could balance this with a fast shutter speed. But not in filmmaking! The only solution is an ND filter. It absorbs so much light that you have to set a larger aperture. 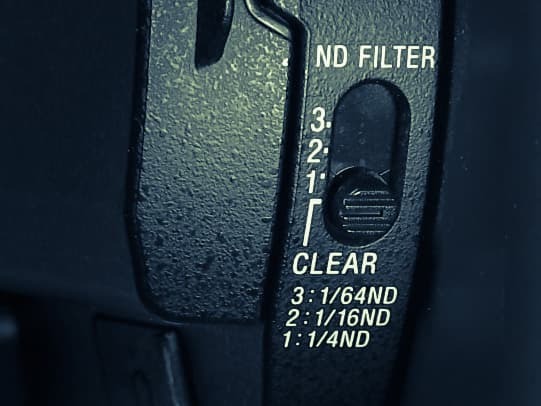 It is exactly for this reason that professional video cameras have built-in ND filters and that their use becomes second nature for every videographer. To see how this works in practise, have a look at the following video.